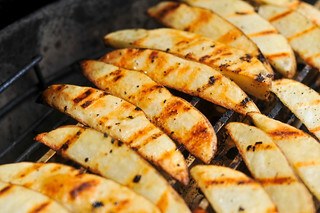 I really love potatoes on the grill, their light flavor allows them to easily pick up the smokiness of a charcoal fire. They don't come without their problems though, with the most perplexing quandary being just getting them to cook right. 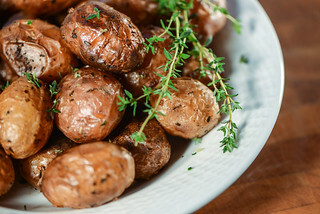 The smallest of the spuds, like new potatoes, can cook fine with a standard sear and roast method, but more substantial tubers benefit with a little pre-cooking. 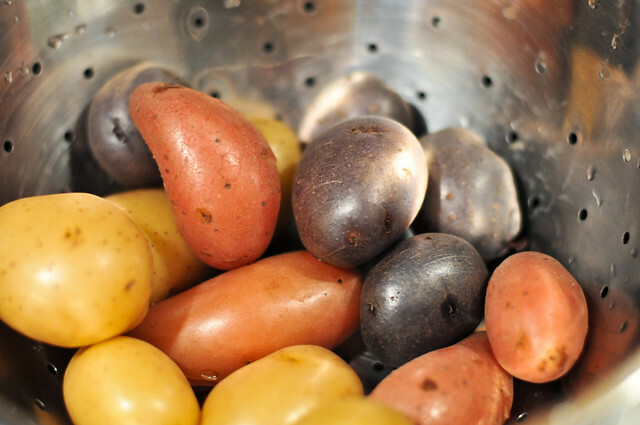 These particular technicolored assortment of small waxy potatoes were first boiled in water until completely softened. Not only did this incredibly speed up the cooking process—it could have taken twice as long to do this on the grill with the risk of the potatoes becoming overly smokey—but it was also great since this jump start was able to happen at the same time I had a planked pork tenderloin going over indirect heat on the grill. 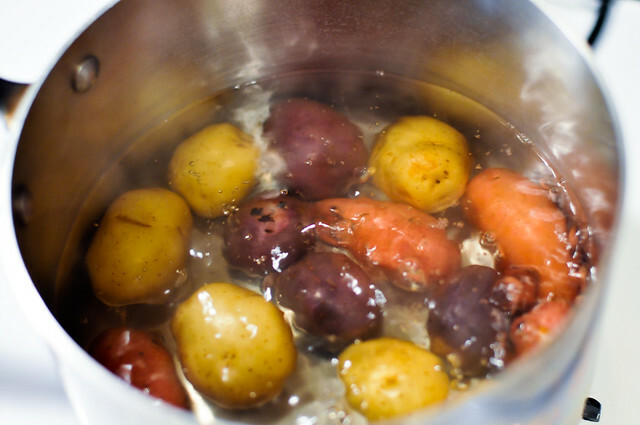 Once the potatoes were softened, they got a nice smashing. With the end goal being some soft and pillowy innards paired with a crisp crust, it was key not to overly smash the spuds, otherwise I wouldn't be able to get the best of both worlds. Cooked and smashed, the potatoes then got hit with some oil, salt, pepper, and rosemary before being taken to the flames. In the amount of time it took the tenderloin to rest off the grill after hitting its desired temp, I was able to finish cooking the potatoes. It only took five minutes per side over direct heat to give the outer shell a crisp and brown crust. While some form of laziness ultimately led me these quick and simple smashed potatoes, it didn't make them any less impressive than more ambitious pursuits from the summer. The crackling of the skin was a great contrast to the creamy insides, with the rosemary adding a nice fragrance and flavor. The best was when a nice piece of charred potato skin was mixed in, giving a hint of the grill that made these such a nice use of the remaining heat after cooking the tenderloin. Just a few more of these easy things and I think I'll be back in business for the big time again, and I already have some plans in the works...keg can turkey anyone? Just because they're quick and simple, doesn't make these crispy and creamy smashed potatoes any less impressive. Light one chimney full of charcoal. When all the charcoal is lit and covered with gray ash, pour out and spread the coals evenly over entire surface of coal grate. Set cooking grate in place, cover gill and allow to preheat for 5 minutes. Clean and oil the grilling grate. 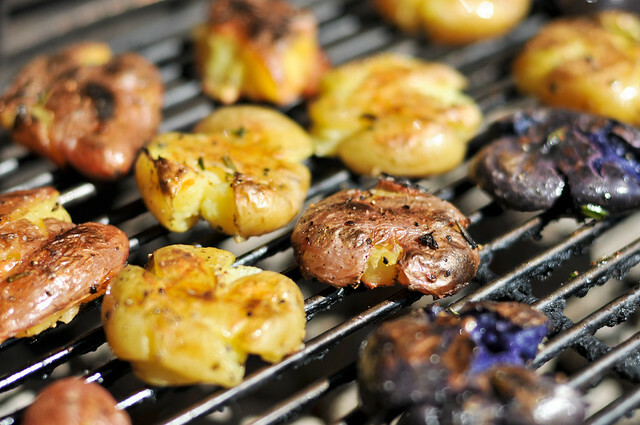 Place potatoes on grill and cook until lightly browned and crisped, about 5 minutes per side. 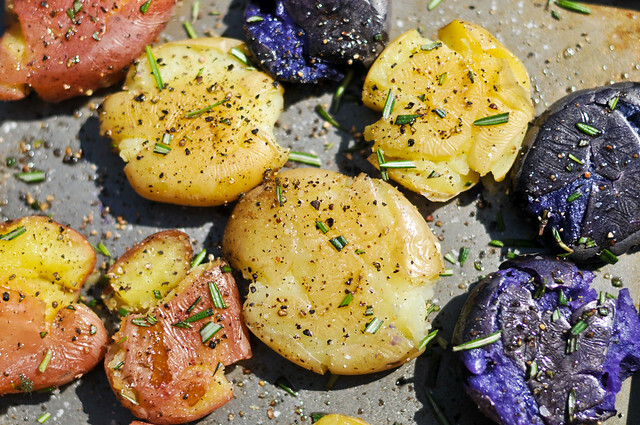 Remove potatoes to a platter, sprinkle with remaining rosemary to taste, and serve immediately. 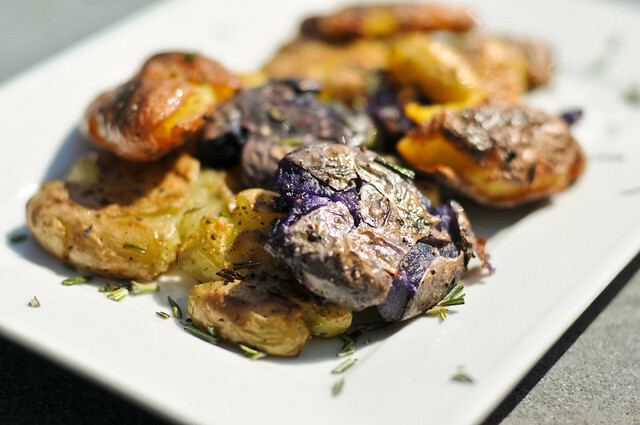 I've done these in the oven before, but never thought to try them on the grill. Awesome idea! They loook delicious, especially with the different colors. 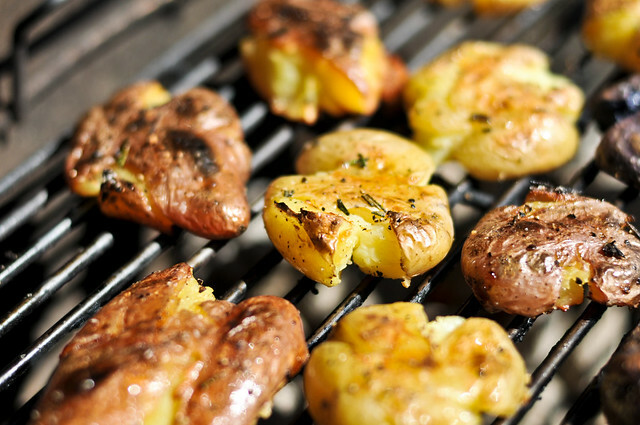 This is our new favorite way to fix potatoes either on the grill or in a pan of butter. We like to wrap the grilled ones with partially cooked bacon to add flavor and help them stay together. 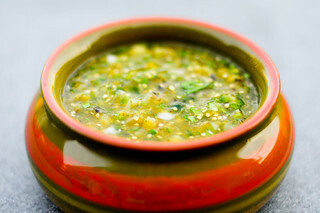 Yes, great way to do them on the grill, I'll be giving this a try. @Keeley I have no problems using the Pinterest share. I use a service for those sharing buttons, so maybe it was just wasn't working right for a little bit.